Custom Kraft paper tube packaging boxes with logo, if the custom packaging no logo will lose meaning, because no logo product packaging will not be able to use or play a brand value. 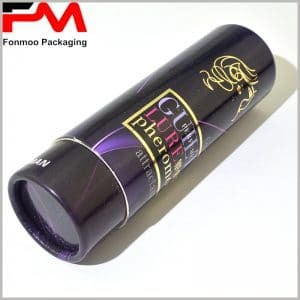 Custom kraft cylinder packaging can determine the diameter and height of tube boxes Can be determined based on the product, so the scope of application is very extensive, can be applied to the packaging of cosmetics, gifts, shirts, trousers and other products to meet your actual needs. If you are aiming at the glass bottle round boxes packaging, you need to play a very good protection, you can use the ring white high-density EVA, for cosmetic bottles or other glass bottles play a fixed role, the use of EVA’s inside the boxes Buffering enhances product protection. If it is a well-known brand, simply print the logo or brand name on the cylinder cover or the main tube body. The pursuit is a simple design style and does not require excessive design embellishments. However, if your brand is not very famous, we suggest that when you print the logo, It is important to reflect directly what is the product through the customized printing and packaging. Directly using the product pattern as the promotion, the result will be better. As a professional tube boxes packaging manufacturer, we have rich experience in the production of kraft paper tube packaging, and we will make every detail the best to ensure that your customized product packaging is of high quality and can promote your product sales and brand The promotion.